One game that I enjoyed so much and that provided one of the best co-op experiences in my life is Portal 2. In that game, we got new mechanics to expand the gameplay introduced in the original and one of them is the introduction of gels that, when applied to surfaces, granted them a special property like propulsion or repulsion. That was my favorite new mechanic from the single player and I wish that we were allowed to manipulate it directly not only through portals. But here is where Splasher comes in. 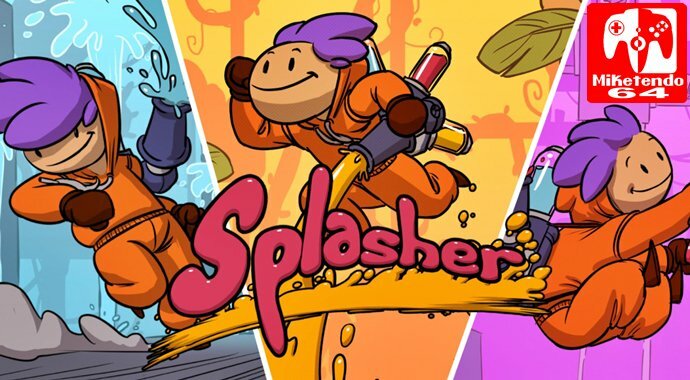 Splasher is an indie 2D platformer, that originally launched for PC and recently arrived on Nintendo Switch, with a gameplay that that resembles Super Meat Boy and in which your main tools to traverse this world full of poisonous ink and deadly traps would be water and special inks, like in Portal 2. This game was developed by SplashTeam, a team that was gathered by Romain Claude, former Game Designer and Level Designer at Ubisoft in games such as Rayman Origins and Rayman Legends. Claude’s past jobs come back in form of references to former games (Level 08 – Rayman Origin), to Portal 2 (Level 20 – The Glados Principle), just to name a few, but also it comes in level and game design of the Inkorp world and the 22 levels you will find in the game. The mechanics with ink are well implemented and scale as you go through the levels. During the first level, you get access to control the water, a few stages after, to the red sticky ink, and halfway through the levels to the yellow bouncy ink. And all of this, allows you to not only traverse the stages, but access new levels in the Inkorp Hall. The ink mechanic doesn’t get repetitive thanks to clever use of hazards that are introduced in their own levels, such as lasers, timed rays, wind, saws and enemies that get more aggressive as you get far into the game. Also, throughout the stage, you will see some other splashers that need to be rescued. There are 7 in each stage and 154 in total. Of the 7, 6 can be found glued to ceilings, surrounded by saws, in high platforms and each one represents one letter which when al are collected, spells out the word “SPLASH”. There are 2 or 3 of them that are located in special zones called “Quarantine zones”, that work similar to the Bonus Rooms in Donkey Kong Country Returns, but no time limit and if you fail, you can try again. The last one, the “!”, can be accessed at the end of the level, if you have retrieved 700 of the gold ink that is spread in the walls and received for killing enemies or spinning golden cranks. The levels are well done, but the real difficulty comes in trying to collect the gold ink and the splashers. If you try to get all seven in the first time you go through the stage, you will probably die a lot, especially in the later stages. But the checkpoint system helps most of the time, with a few occasions in which I thought that they were spaced a little too far apart and didn’t reward you for completing a difficult part. Also, when you return to the checkpoint, you will need to collect everything that you got after that point, with the exceptions being the golden cranks and the splashers rescued in the “Quarantine zone”. I liked this format, but I admit that it got me to get angry when I kept dying in the last level and had to repeat the same process over and over again. The mechanics wouldn’t work without good controls and this game gets it almost perfectly with just one small problem that kept making me die. The game is, initially, controlled with the left stick or de directional buttons, for movement, and B, for jumping. When you get the water and the inks, the Y shoots water, the A shoots the red sticky ink and the X shoots the yellow bouncy ink and the left stick or de directional buttons start working as aim too. Many of my deaths were because while I had to aim in one direction, I made the character walk. That isn’t a big problem, especially if you decide to use the directional buttons, but I have to say it annoyed me a little in the later levels and when you need to be agile. The story is simple but it is efficient to set the story and explain why the mechanics revolve around ink. It is told through a cutscene in the beginning and the end and a few smaller scenes in some levels. I also liked the chosen graphical style for the game, as it was very well drawn and animated, with the standout being the protagonist that captivated me and got a personality seen in the animations that differ him from the other splashers. Also, if you stop to look at the environment of a stage and the Inkorp hall, you can see production lines for some of the enemies, you can get a hint of what will happen in the given stage by what is near him and many more details that help set this style and the contextual story. Also, I have to praise the music that is perfect on all the levels and at the same time, gives you the energy to keep going. The standard mode, as the game calls, represents only 63% of the game, the other 37% represents a Speedrun aspect part of the game, that is represented by Time Attack and 3 types of speedrun. In Time Attack mode, you run to complete each level in the lowest time possible and I warn you that a good idea of how the level plays out or a good improvisation is required if you hope to get Gold in all the levels (I normally get Bronze). It is a way to continue playing the game, and I kept coming back to try and finish with a better time. But it is also here that I found a bug. Sometimes when I started a new run pressing L + R, it starts normally, freezes and plays the loading again and in a few occasions, the game froze for a second before starting, but nothing that will break the experience, but something that I would love to see fixed as I start a new run constantly. Also, there are 3 speedrun modes, 1 that is unlocked from the get-go and one that you unlock when you finish the game and another if you collect all the Splashers in the game. Each one is focused on something specific such as finish the level without collecting anything, collect all the Splashers or a standard speedrun. They are fun if you want the ultimate challenge after you beat the game and want to compete with others online. Splasher is a game that surprised me by how well they implement the mechanics in a way that fits speedrunners and those who just want to play casually. It kept pulling me back and even if I wanted to stop, I played one more level, as it challenges you in the right amount most of the time and can get difficult in the end. An excellent visual, a story that is more contextual than active and music that I enjoyed listening and didn’t distracted me. Even with my small problem with the aim and the lack of Switch specific features, this game has a lot to offer, especially if you like platform games, to speedrun and collect all the level has to offer and I can say that I had a blast playing it.